A little over two years ago, I reviewed Jeffrey Talanian’s delightfully inventive RPG Astonishing Swordsmen & Sorcerers of Hyperborea, a massive boxed set created in homage to the original boxed edition of Dungeons and Dragons. Time has not diminished my admiration; it remains one of my favorite games released in the last ten years. In fact, my only criticism — as I mentioned in my review — was the small number of supporting products. 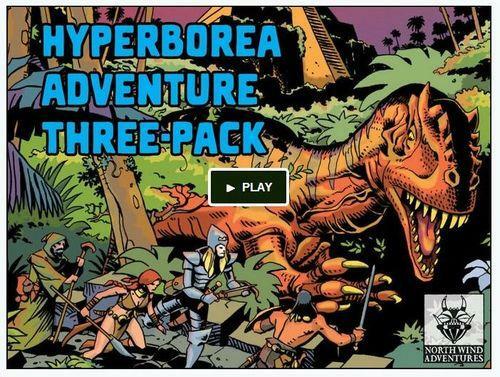 That’s why I was so pleased to see a new Kickstarter, for the Hyperborea Adventure Three-Pack, a campaign created to fund the publication of a trio of deluxe adventures for the game: Ghost Ship of the Desert Dunes by Jeff Talanian, Forgotten Fane of the Coiled Goddess, by Joseph D. Salvador, and Beneath the Comet, by Ben Ball. These sword-and-sorcery adventure modules will each flesh out a different chuck of Hyperborean geography, and each is suitable for use with other games, such as Labyrinth Lord, Castles and Crusades, Swords & Wizardry, and of course, the game start started it all, D&D. The campaign has a goal of $14,000 and, after less than 48 hours, has already raised over $12,000. Stretch goals include inside cover maps, additional art, and bookmarks, and I think the odds are good that more will be added. Check out all the details here. Can’t ever have too many Sword & Sorcery adventures. Especially by people who actually know what they are doing. Looks like this project just got funded!